Preserved lemons are a staple ingredient of North African cuisines, particularly in Moroccan foods, where it is used in tagines, stews, and sauces. In doing some research, I found out that they are also used in some Asian cuisines as well, such as the Khmer dish, ngam nguv, a lemony Cambodian chicken soup and as the traditional accompaniment to curd rice, which is often served as the last course in South Indian meals. Making preserved lemons, sometimes referred to as pickled lemons or lemon confit, is a snap, but the hard part is waiting for them to cure for about 30 days. No special equipent is needed, just a sterilized canning jar, salt, and perhaps some extra lemon juice to fill the jar. While other recipes call for the addition of bay leaves, cinnamon, and peppercorns, I chose to preserve my lemons simply with salt and lemon juice. By making the brine more neutral, the lemons and juice are more versatile and may be used in more recipes. 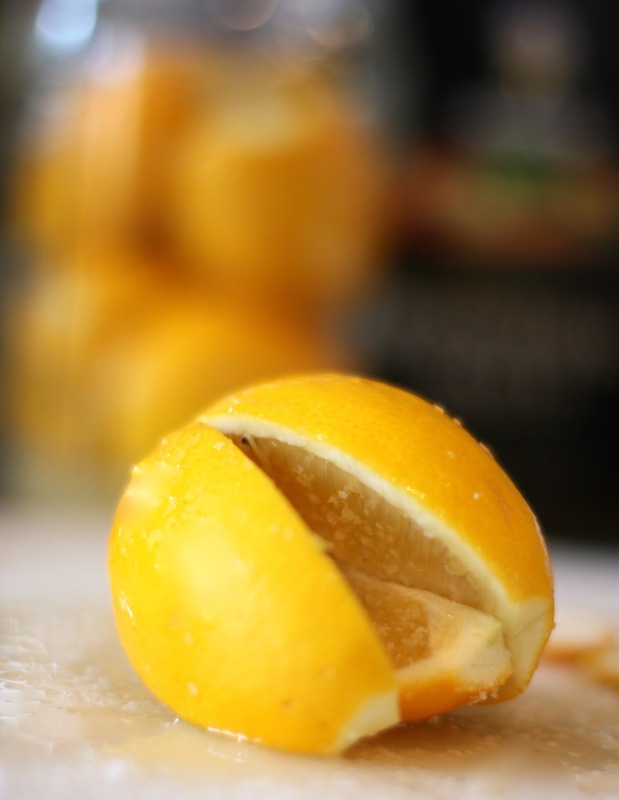 Meyer lemons are perfectly suited for this method of preparation due to their smaller size, smoother rind and sweeter flavor. After the lemons cure in its own juice (hence, the confit reference), the rinds become silky and take on on an intense and complex lemon flavor – a little tart, a little sweet, and pleasantly bitter. The lemon pulp and juice are generally used for sauces and stews, and the salty lemon juice may be used in making Bloody Mary cocktails. However, the star of the show is the lemon rind, which can be cut into thin strips and added to braised meats, near the end of the cooking process, or finely chopped with shallots and parsley, mashed with olive oil or butter to garnish seafood. There are so many uses for preserved lemons, but my intention is to first use them in a recipe I found for Moroccan Chicken with Preserved Lemons and Olives. Stay tuned for this, in about a month! Place 1 tablespoon salt on the bottom of a sterilized one pint canning jar. Quarter the lemons starting at the top to within 1/2-inch of the bottom, sprinkle salt on the exposed flesh, and then reshape the fruit. Pack in the lemons in the jar and push them down, adding more salt, and lemon juice, if needed. Press down the lemons to release their juices and to make room for the remaining lemons. (If the juice released from the squashed fruit does not cover them, add freshly squeezed lemon juice — not chemically produced lemon juice or water.) Leave some air space at the top of the jar before sealing. 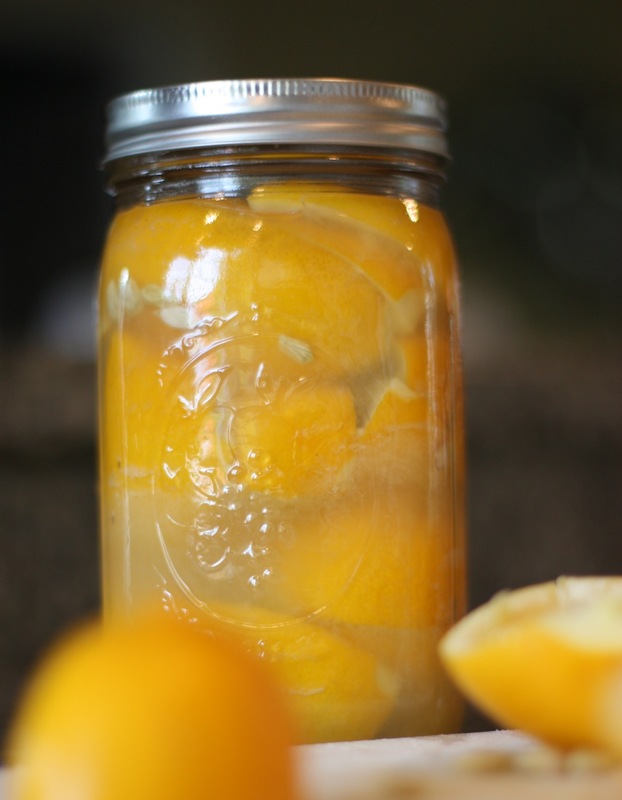 Let the lemons ripen for 30 days in a warm place, shaking the jar often to distribute the salt and juice. To use, rinse the lemons as needed under running water to remove excess salt. I made these once and no longer remember what they taste like. Guess I’ll have to make them again with your easy, simple recipe. Thanks, Daisy. Another very informative post, beautifully presented, thanks so much! Looks AMAZING. Have seen this on wordpress very frequently recently and they always look great. Wonderful post, Daisy.